A Seoul court sentenced a former chief of Woori Bank Co. to 1 1/2 years in prison Thursday for giving favors to jobseekers who have ties with the bank's VIP clients or ranking government officials. 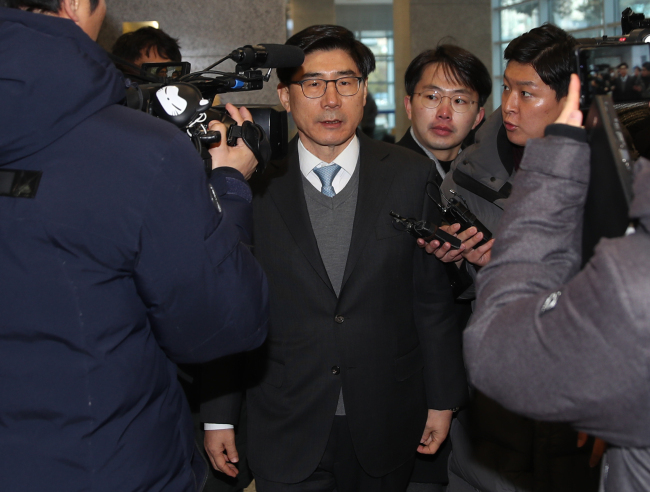 The Seoul Northern District Court handed down the verdict to Lee Kwang-goo, who headed the lender from 2015-2017, finding him guilty of "obstruction of business." Lee was immediately taken into custody following the ruling, as the bench issued a writ on grounds that the defendant presents a flight risk. Lee was indicted early last year, along with a few other Woori officials, over the irregularities. He resigned as bank chief in November 2017 after the allegations surfaced. After looking into local major banks' alleged unfair hiring, state prosecutors charged a number of executive level officials at KB Kookmin Bank, KEB Hana Bank and three provincial banks.